The Medieval Times Dinner & Tournament is an adventure unlike anything you have ever experienced before or will ever experience again! 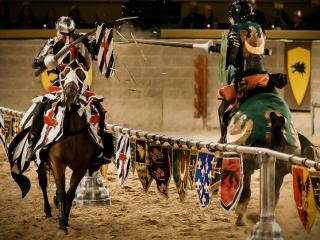 During each live performance, guests of the castle enjoy an authentic medieval feast while valiant knights on horseback do battle to the death. Brilliant Costumes, authentic in every detail add to the splendor of your visit. Cheer your brave knight to victory as he competes in games of skill, hand to hand combat and of course, the joust. Four-course meal including savoury garlic bread and hot vegetable soup, roast chicken, corn on the cob, a seasoned potatoes and pastry of the castle. Plus book your Medieval Times Dinner & Tournament Tickets today and get the royal treatment with a free VIP Royalty upgrade worth over $20!